Palvella’s focus is on serious, debilitating rare diseases that currently lack a single approved therapy. Normal keratin filaments form a strong structural network (top) that enables cells to withstand pressure and stretching. 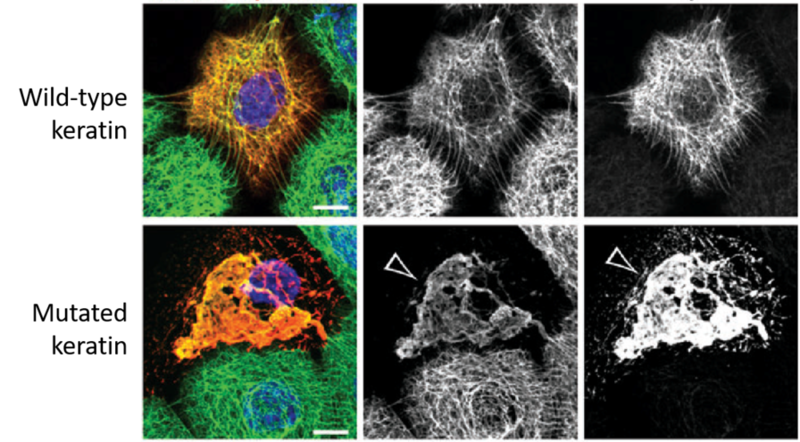 Mutant keratin proteins form clumps (bottom), resulting in weak cells that break under pressure. Kubo, A. et al. (2013) The Journal of Dermatology 40(7):553-7. Palvella’s lead program, PTX-022, aims to be the first treatment for patients with pachyonychia congenita (PC), a rare, autosomal-dominant disease caused by a mutation in one or more of the five genes (KRT 6a, KRT 6b, KRT 6c, KRT 16, or KRT 17) responsible for the production of keratins. The production of mutated keratin filaments is the primary driver of pachyonychia congenita. Ultimately this genetic defect leads to the exquisite plantar pain derived from blistering, the presence of neurovascular structures, dermal inflammation and atypical painful callous formations on the feet. Furthermore, the stress from simple activities such as walking or standing causes trauma to these weakened cells, which triggers the production of mutated keratins, which in turn exacerbate these manifestations and contribute to increased pain and debilitation. Almost all patients experience constant plantar pain, making walking or standing difficult. Often patients experience a partial or total loss of ambulation. There are currently no FDA- or EMA-approved treatments for PC.